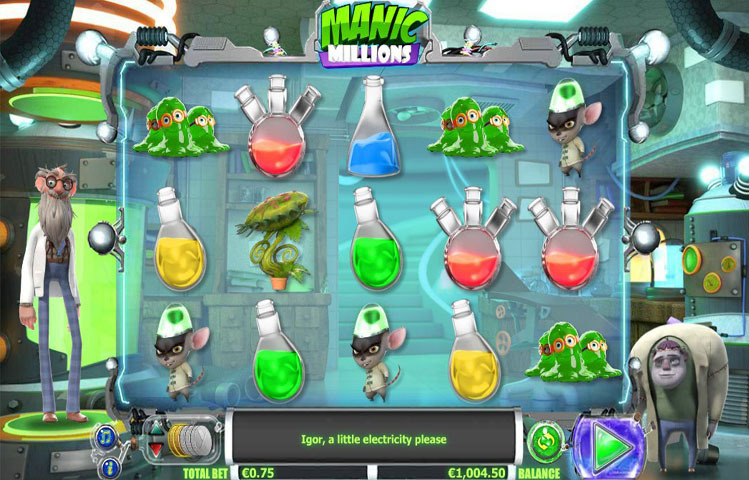 Manic Millions is the newest game by Next Gen Gaming. This new slot takes players on a great experience that they will never forget. This is because it takes them inside the laboratory of a crazy scientist and his assistant, Igor. Players will witness the wild experiments of the scientist as they get to claim their share of the fortunes resulting from them. The game has 3D animations and visuals that provide players with a visually satisfying experience. Check it out right here for free and see what the slot has to offer in terms of fun, rewards and features. Manic Millions is a Next Gen Gaming title, this is why players can expect a highly rewarding and a fun experience. This is exactly what the game offers. It takes players on a wild experience that is full of excitement, and rewards. This is because the game takes place inside of the laboratory of a crazy scientist. Players will also get to see Igor, his assistant that helps him around the lab. Players will not only watch the crazy experiments, as they will get to claim plenty of prizes and rewards while doing so. The game is offered to players in a 5 reel setup that is home to 25 wager lines. All payouts that the symbols can give are found at the paytable. Players can view the paytable as they click on the “I” button under the slots’ reels. The control panel also includes all of the buttons through which players will control the game play. This includes placing bets, spinning the reels, viewing the balance and the auto play option. Manic Million’s visuals and symbols are of the highest quality. They all come in 3D animations. This includes the characters around the reels, as well as the symbols on the reels themselves. These symbols turn to animations when they are a part of a winning combination. These icons include laboratory beakers and test tubes, and the logo of the game. Other symbols include the main characters of the game. These characters are the assistant Igor, and the crazy scientist. As for the background of the reels, it takes place in the laboratory. This is why players will see science tools, equipment and chemical solutions all around the game’s reels. Manic Millions has two special icons. The first one is the wild icon which comes in the form of the scientist icon. This wild would replace all other icons to help players get a reward. It will not replace the logo of the slot, which is the scatter symbol. The scatter logo “Manic Million” would give players scatter rewards as well as trigger the free spins round. Three at least need to land on the reels for the free spins round to occur. This free spins round gives players 10 spins, with Igor giving players more wilds on the reels.